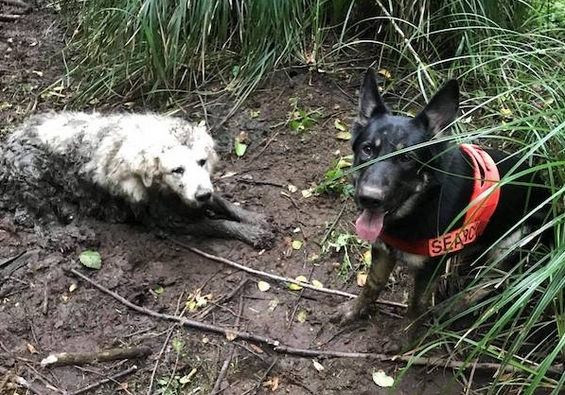 White Wolf : Puppy was trapped in the mud for two days before being rescued … by another dog! Puppy was trapped in the mud for two days before being rescued … by another dog! A wonderful dog-to-dog rescue unfolded in Washington state this past weekend when Tino — a search and rescue dog — was called in with his human counterparts to find Puppy, a dog who disappeared two days earlier while on a trail ride with owner Karen James, according to Fox 13. Puppy’s owners initially sought help in finding the pooch via the Useless Bay Sanctuary. Puppy, per the station, spent more than 40 hours in mud and was hauled out via ropes before being reunited with his family. After placing Puppy in a wagon, he was transported home where his family was overjoyed to see him. Responses to "Puppy was trapped in the mud for two days before being rescued … by another dog!"